In the futuristic 2025 setting of Call of Duty: Black Ops II, the United States has become locked in a second Cold War with China due largely to a shortage of rare earth elements, which are vital in the creation of a lot of the technology and advanced military hardware we use today. In the present-day (in real life), China controls a huge percentage of the world's rare earth elements. The fictional future of Black Ops II has a much stronger real-world hook than your average techno-thriller. When I spoke with Treyarch's studio head Mark Lamia last week, he was vague about the extent to which Chinese troops will factor into the story, either as enemies or as playable characters. But he did tell me about the real-world organization that players will be up against. 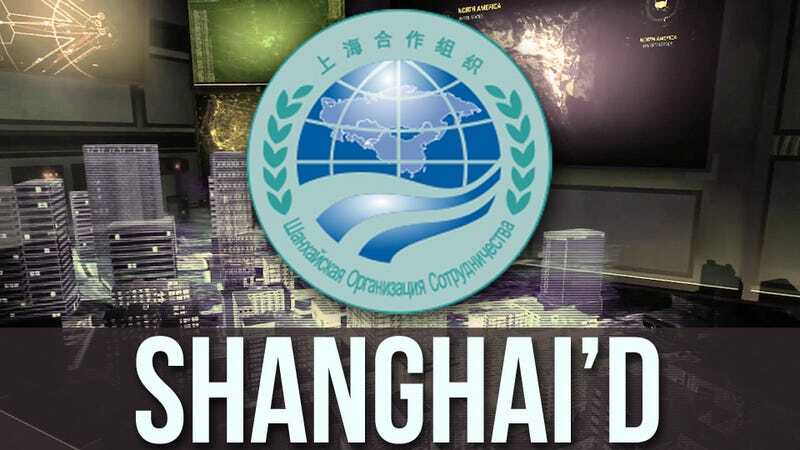 The primary state-sponsored opposing presence in Black Ops II's story will be represented by the Shanghai Cooperation Organisation, who despite their China-centric name are a multinational organization created in June of 2001 between Kazakhstan, China, Kyrgyzstan, Russia, Tajikistan, and Uzbekistan. They are currently considering expanding, with Mongolia, Pakistan, India and Iran all have "observer status"—those four nations aren't full members, but they have expressed interest in becoming so. "In our fiction, in the future," said Lamia, "[the SCO has] militarized even more so than they are now. They have their own special forces. Their own black ops. "As the proxy war conflicts occur," he continued, referring to the fictional proxy wars in the game's 2025 conflict, "you might encounter these SCO forces." He was cagy on whether or not players would actually get to step into the boots of the SCO's black ops soldiers. "Maybe they'll be a part of the multiplayer. Who knows?" The main goals of the SCO are strengthening mutual confidence and good-neighbourly relations among the member countries; promoting effective cooperation in politics, trade and economy, science and technology, culture as well as education, energy, transportation, tourism, environmental protection and other fields; making joint efforts to maintain and ensure peace, security and stability in the region, moving towards the establishment of a new, democratic, just and rational political and economic international order. The increased prominence of the SCO has led policymakers and scholars to question if the organization might complicate the United States' ability to secure [Central Asian] interests. Some experts believe that Russia and China want to use the SCO to curb U.S. access to the region's vast energy supplies. Similarly, the SCO's call for the United States to withdraw military forces (USA Today) from the region was seen as an explicit challenge to the U.S. military presence in Central Asia. Lastly, SCO members are uneasy about certain U.S. policies, particularly its support for democratic reforms. "Frankly, none of the [SCO] countries shares our enthusiasm," about political reform, said CFR's Feigenbaum in his Nixon Center speech. The "color revolutions" in Ukraine, Georgia, and Kyrgyzstan, which unseated leaders loyal to the Kremlin, have also led Russia to view the U.S. presence in post-Soviet states with suspicion, while Beijing sees U.S. forces along its western border as part of Washington's strategy to contain China. This all sounds like some thorny, topical material for a hugely popular military game to dig into. Black Ops II, however, has a narrative escape hatch for any potential controversy that could arise. As I prodded him about China and the SCO, Lamia was sure to repeatedly remind me that the game's real antagonist will be an individual named Raul Menendez, who is presumably acting alone. Menendez has hacked into America's drones and robotic tanks and is attempting to stir up existing tensions and pit the two superpowers against one another. It's a shopworn but effective storytelling trick that will no doubt keep Treyarch from making China, a current global superpower, into the "real" bad guy in a game that will doubtless sell millions of copies worldwide. All the same, this all feels much more relevant than past Call of Duty games. At the very least, the opposing force won't simply consist of Russian Ultranationalists and Middle Eastern religious extremists.